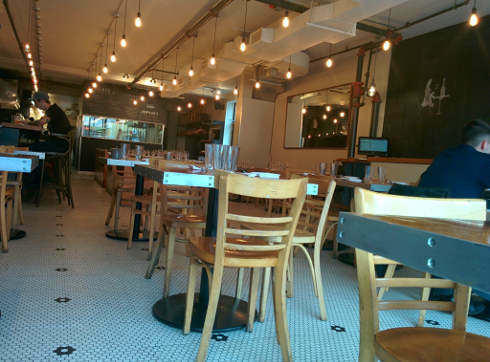 Salle a manger is large and long with an ample seating capacity; the menu is on the chalkboard with the exception of brunch, which is on a paper menu. With large windows up front, which can open up in summer, it is well lit and the church pews add a nice touch to the middle of the dining hall. Food The menu has a dozen items, with some of the smaller ones priced between $4-$9 and the larger dishes are anywhere from $11-$14. Coffee is not included and there is no drip coffee and no refills. You can also order some of their dinner sharing dishes which are available at brunch. Now being with my resident drink reviewer we needed to ensure we got some liquid nutrition. 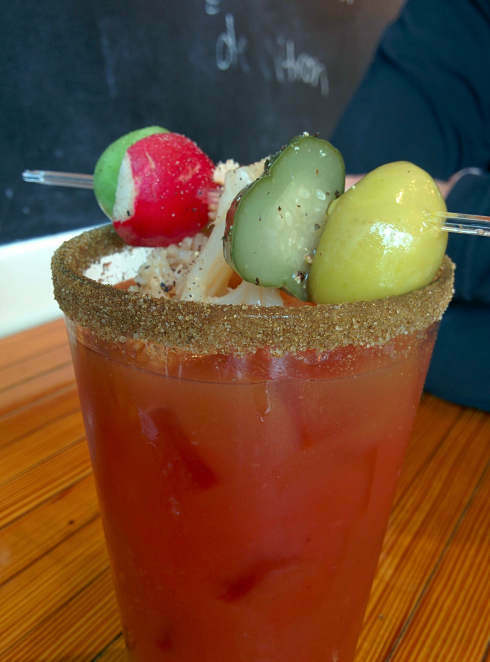 The Bloody Caesar was garnished with a variety of pickled items which made for an impressive garnish although the drink itself was still your standard clamato juice base with a good rim. The pamplemouse aperol cocktail initially had me hesitant as my first sip did not win me over but something happened on my second sip, the drink opened up and I could see myself ordering it again. Up first was the braised short rib, on a bed of lentils topped with a poached egg $14. 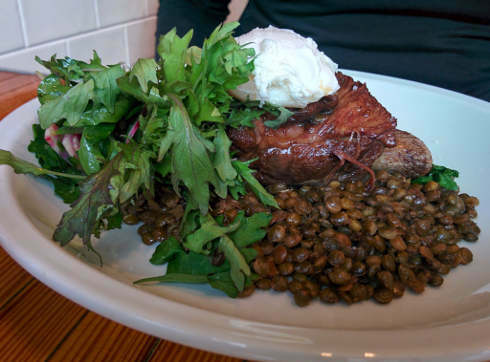 This dish was plentiful and thanks to a generous and delicious short rib, the bed of lentils ensure that if you were still hungry after the rib, the lentils would finish the job and the egg makes this dish “breakfasty”. I went for the pulled pork waffle with old cheddar and remoulade $14. 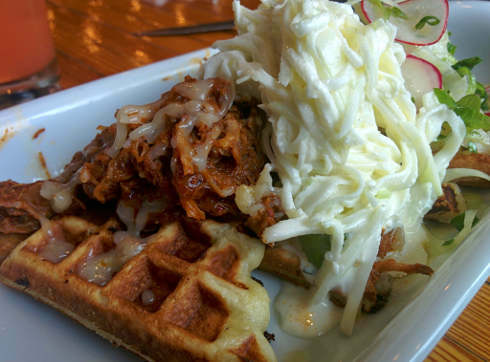 This dish attracted me not only because of the pulled pork but also because of the fact it used a waffle, which many places tend to neglect. Albeit a meaty dish, this in no way shape or form makes this anything short of delectable and filling. The only negative I could find is the left hand of the plate had too much white space on it and that is a pet peeve of mine, but I was full at the end even with the white space. 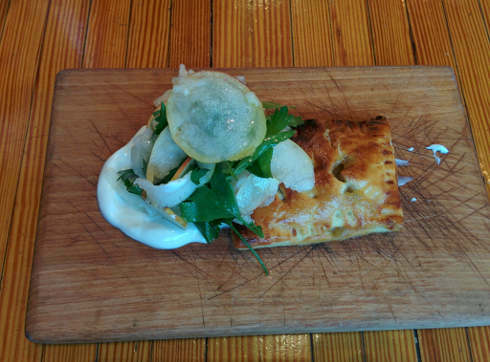 We also had some desserts, a pear turnover $5 from the entrée section which had a nice yogurt base and the dough of the turnover was not too flaky and messy but just right. The pear was not too pronounced which is difficult to do since I find it is subtle but oh so tasty. I also like the fact that they chose pear and not apple which is what most people expect so the change up makes this dessert decision an easy one. 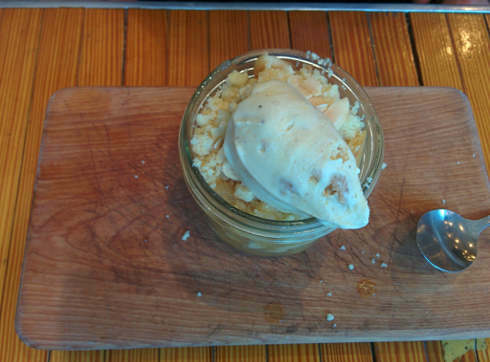 We also had the apple crumble $7, which was presented in a jar and topped with ice cream. Normally I am hesitant of mason jars being used for anything other than preserves although having this dish in a jar gives you better access to the apples which is brilliant and made for a happy dessert moment. Service Our waiter was quite helpful with the menu, explaining items, advising us when items were not available and helping us avoid heartbreak before getting attached to a dish (this happens often with me when I look at a menu). Vegetarian Although the dishes we tried were meaty, there are lots of vegetarian options making for a balanced menu. Wrap up I love the fact you can have a really late brunch on Sundays which will make peoples lives much easier. The food was filling, tasty and the menu was varied. The capacity is large so it’s also good for large groups. A main dish and a coffee will get you to the $20 range so keep that in mind, having drip and refills would be a nice addition although I will definitely be coming back and trying some other dishes.